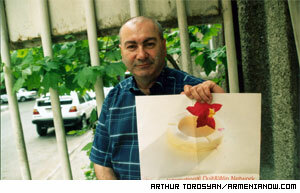 For Mikayel Abrahamyan, 49, this month was another opportunity to test his will and to return to a healthy life style. Mikayel Abrahamyan is trying to quit. An international competition is his incentive.. This year, just like citizens of 100 other countries, more than 360 smokers of Armenia participated in the international Quit & Win anti-smoking competition. Participants fill in special forms according to which they are obliged not to smoke from May 2 to May 29. Also, two witnesses are registered who have to control the one who “gave a promise”. According to the organizers of the project, even though the locals were late to learn of Quit & Win, the competition attracted a lot of attention. As a result, many of those from the capital and the regions who want to try their nerves and their will and are anticipating prizes, came to take part in the project. Coordinator of Quit & Win program David Petrossyan says participants of the project are mainly middle aged men. There are fewer women, since most women in Armenia are trying to hide the fact of their smoking. David Petrossyan help start the anti-smoking contest..
Petrosyan says that according to the rules of the competition each week their colleague calls the participants and tries to find out whether they have broken their promise. As a result, it turned out that the number of those whose will is strong had cut to 120, the rest went back to smoking. According to organizers, those people who resist and don’t smoke till the end will get prizes and will feel more healthy. “Witnesses will be questioned after which by special indicators we will check the participants to find out whether they’ve smoked or not during the prohibited period. 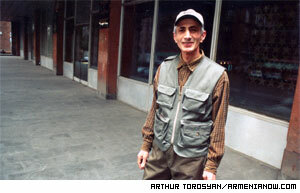 After that, the winners will get prizes through lots drawing,” says Petrosyan. Winners compete for cups, shirts and luggage. Names submitted to Helsinki will be subject to a computerized drawing from which there will be six prizes of $2,500 and one grand prize of $10,000.